A glass extension is an impactful and stunning addition to a house of any style, whether it's a matching addition to a modern home, or a contrasting extension to a traditional property. Glazed extensions are also a perfect way of creating room while flooding existing space with light, with the addition of bi fold doors and roof lights. If you’re looking to extend your home, fill your home with light, or are simply looking for inspiration for your future project, get some ideas from this selection of incredible glass extension ideas. 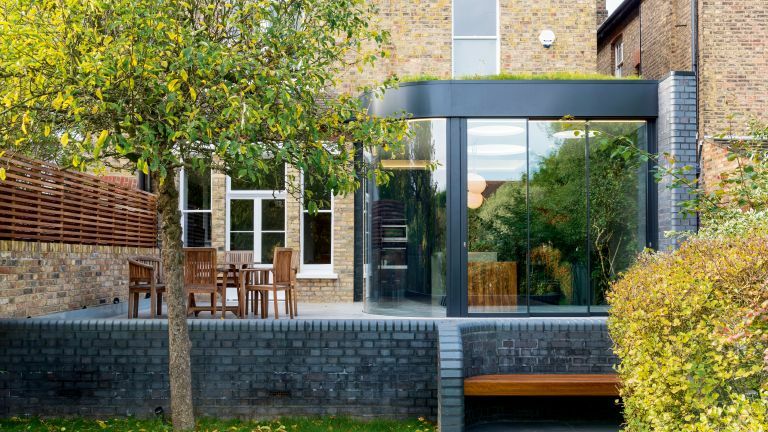 Find out all you need to know about building a glass extension in our practical guide. To create an uninterrupted view of the garden from their East Sussex home, the Pollins family wanted to remove the boundaries between indoors and out. Origin’s bi-fold doors were recommended for the large expanse of glass and modern architecture they wanted. Two sets allow the entire extension to open out, with the aluminium doors powder-coated in white to match the French windows. Find out how to choose the best bi-fold or sliding glass doors, and don't miss our guide to choosing rooflights. This County Armagh-based family asked Des Ewing Residential Architects to reorganise their home and open it up to the garden. The result was a simple contemporary box-shaped extension, with two-storey windows and a double-height space giving it a dramatic look. Aluminium-framed glazing and zinc cladding keep it maintenance-free. A new kitchen-dining-living area leads out to a patio. Find out more about how to build a two storey extension in our guide. Architect John Onken was asked to transform the ground floor of a west London house by its owners, who wanted a simple yet elegant kitchen and dining space to complement the new kitchen cabinetry they had planned. A frameless glass addition was designed to make use of the small patio garden, blurring the boundary between eating inside or alfresco. Black porcelain floor tiles contribute to the seamless connection, and the challenge of lighting the space at night was solved by positioning a light fitting at the edge of the space to throw light inward. Tasked with sensitively extending this traditional cottage in Esher, Surrey, by the couple who own it, IQ Glass had to make the new structure as minimal as possible. A glass box-style design with supporting steel sections features painted glass bands in a light grey finish to match the existing palette. The new space now houses a home office, which sits perfectly on the corner of the property. Find out all you need to know about designing a home office in our guide. As part of a refurbishment, this north London family asked Lipton Plant Architects to create an open-plan space leading out to the garden of their home. To obtain a level finish, the floor of the entrance room was lowered to meet that of the rear room. The depth of the floorplan meant as much light as possible was needed, so a glass box design lets daylight in, while creating better views of the garden through bi-fold doors. Find out how to plan the perfect kitchen extension in our practical guide. The owners of this Grade II-listed north London property wanted to open up the lower-ground-floor kitchen and living area and extend into the garden, so asked Smerin Architects for a light-filled contemporary glass extension. The local authority planners didn’t object to a glass-box-style new addition supplied by IQ Glass, and the back wall of the original house can be seen through the glazing. Find out more about adding a glazed extension to a listed building. A single-storey and a double-height extension were designed for this family home in Leatherhead, Surrey, by Granit Architects. A glass box was created at the point where the house changes orientation, and the extension runs parallel to the boundary. Glass articulates this pivot, introduces light, and creates a 180º view. A sliding pocket door can be drawn across the glass to make the space cosy in winter. Find out more about the ins and outs of adding a conservatory or sunroom to your home in our guide. Poor garden access and a dark kitchen led the owners of this Victorian home in Edinburgh to ask Zone Architects for a contemporary glass extension ideas. A glass-walled pavilion features a slender-edged floating roof to avoid a top-heavy appearance, with fully retractable glass doors on its southern aspect. It adds a light-filled kitchen-diner to the house, and continues the series of reception rooms that face the garden. See more statement extension ideas in our design gallery. A glass box was created at the point where the house changes orientation, and the extension runs parallel to the boundary. Glass articulates this pivot, introduces light,and creates a 180º view. A sliding pocket door can be drawn across the glass to make the space cosy in winter. Find out more about building a single storey extension in our essential guide. If yours is a period home, a contemporary glazed box might not suit it – or your taste. And, while conservatories look beautiful in rustic settings, an urban property is better suited to orangery-style glass extension ideas. The difference? An orangery tends to have more solid elements to its structure – although it is mostly a glazed addition. Find out all you need to know about planning an orangery in our design guide. We love a spot of statement glazing, and this stunning side return extension has certainly captured our attention. Glass works best in a barely-there style, so we love the wide expanses of glazing and the boldly executed roof. The exterior packs a punch thanks to the contrast of traditional brickwork and sleek black-framed finish. Most of all, though, we’re sold on the window seat. Picture chilly autumn nights curled up with a cushion, a glass of wine and a blanket... bliss. A similar extension would cost around £70,000. Extension by Yard Architects. Photo by Richard Chivers. Find out more about building a side return extension in our guide. Kitchen extensions don’t get much smoother than this. Curved glazing, slate grey bricks and elegant circular rooflights? We’re swooning. Opting for glazing instead of solid walls for your extension isn’t only a way to bring the outside in – it’s a brilliant solution for anyone wanting to build a modern addition without challenging the period features of a Victorian house. And to top it all off, a wild meadow roof means you won’t lose your garden views from the first floor (and it’s great for the environment, too). This project, completed by Ar’chic Architects cost £140,000.